Dolphins grace Hawaii’s shores year round. Dolphins are a classic symbol of Hawaii, one of those things that tourists want to see. The dolphin that I’ve seen the most is the Spinner Dolphin. It jumps out of the water, spins vertically and splashes back in. They are notoriously difficult to photograph because they never hold still, never warn you they are about to jump, and spin REALLY fast. Pod of wild spinner dolphins in Kauai. Photo by By Fairsing (Own work) [Public domain], via Wikimedia Commons. Dolphin fantasy 1: Seeing wild dolphins, and taking a picture of them. often on snorkeling or boat trips. Dolphin fantasy 2: Swimming with wild dolphins. Reality check: Yes, it can happen, but it requires patience and luck. I once was circled by wild dolphins and it was magical. The best way to see dolphins? 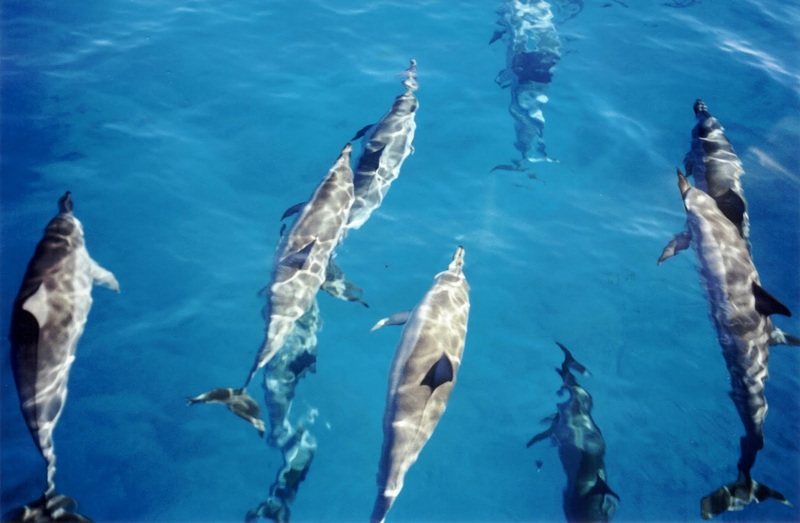 There’s no guaranteed way of seeing dolphins, but often they like to accompany boats so if you go on a boat or snorkeling trip, you may luck out! ...or get up early in the morning! If you have done your homework, you'll know which beaches dolphins tend to frequent. I've decided to shorten this post a lot, for blog hoppers from the A to Z Challenge. I've got a follow up post started with more info on where dolphins have been sighted off of Maui and suggestions on how to increase your chances of encountering wild dolphins. Aloha, and mahalo for reading! P.S. If you're blog hopping, please include a link if you comment! Awesome - dolphins are such beautiful creatures! Started off fine with A and somehow missed B and C. I am really enjoying your view of Hawaii. The dolphin pictures are incredible. This is my favorite post so far. You know I'm a wildlife lover. It would be so fun to swim with dolphins and getting a photo would be fantastic. Nice images. Thanks, they are not my images though! I've had bad luck talking dolphin photos! Thank you. Pinterest is fantastic. Yes, they are! Mahalo for commenting! I love dolphins! I've had the chance to feed them at the two places where it is allowed here in Queensland, and it's an amazing experience. Wow, that has to be an experience of a lifetime. Feeding dolphins! I imagine there are some guidelines for what is appropriate to feed them. It was pretty amazing. All very regulated. They give you a fish, and you're told where your allowed to touch them etc. But still a great experience.